Personally Identifiable Information (PII) is a legal term pertaining to information security environments. While PII has several formal definitions, generally speaking, it is information that can be used by organizations on its own or with other information to identify, contact, or locate a single person, or to identify an individual in context. Non-sensitive PII can be transmitted in unsecure form without causing harm to an individual. Sensitive PII must be transmitted and stored in secure form, for example, using encryption, because it could cause harm to an individual, if disclosed. Organizations use the concept of PII to understand which data they store, process and manage that identifies people and may carry additional responsibility, security requirements, and in some cases legal or compliance requirements. In the United States, the National Institute of Standards and Technology (NIST)’s Guide to Protecting the Confidentiality of Personally Identifiable Information defines “personally identifiable” as information like name, social security number, and biometric records, which can be used to distinguish or trace an individual’s identity. In the European Union, directive 95/46/EC defines “personal data” as information which can identify a person via an ID number, or factors specific to physical, physiological, mental, economic, cultural or social identity. In Australia, the Privacy Act 1988 defines “personal information” as information or an opinion, whether true or not, about an individual whose identity is apparent, or can reasonably be ascertained—a much broader definition than in most other countries. 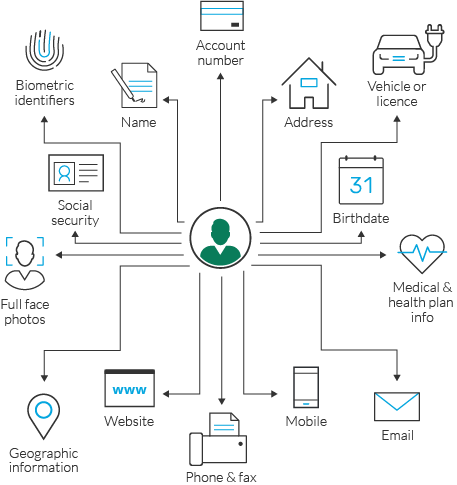 In New Zealand, the Privacy Act defines “personal information” as any piece of information that relates to a living, identifiable human being, including names, contact details, financial health, and purchase records. In Canada, the Personal Information Protection and Electronic Documents Act (PIPEDA) and Privacy Act defines “personal information” as data that on its own, or combined with other pieces of data, can identify an individual. According to the NIST PII Guide, the following items definitely qualify as PII, because they can unequivocally identify a human being: full name (if not common), face, home address, email, ID number, passport number, vehicle plate number, driver’s license, fingerprints or handwriting, credit card number, digital identity, date of birth, birthplace, genetic information, phone number, login name or screen name. Beyond these clear identifiers, there are “quasi identifiers” or “pseudo identifiers” which, together with other information, can be used to identify a person. For example, according to a US governmental study, 87% of the US population can be uniquely identified by a combination of gender, ZIP code and date of birth. Pseudo identifiers may not be considered PII under United States legislation, but are likely to be considered as PII in Europe. Who is Responsible for Safeguarding PII? From a legal perspective, the responsibility for protecting PII is not solely attributed to organizations; responsibility may be shared with the individual owners of the data. Companies may or may not be legally liable for the PII they hold. However, according to a study by Experian, 42% of consumers believe it is a company’s responsibility to protect their personal data, and 64% of consumers said they would be discouraged from using a company’s services following a data breach. In light of the public perception that organizations are responsible for PII, it is a widely accepted best practice to secure PII. A common and effective way to do this is using a Data Privacy Framework. A Data Privacy Framework is a documented conceptual structure that can help businesses protect sensitive data like payments, personal information, and intellectual property. The framework specifies how to define sensitive data, how to analyze risks affecting the data, and how to implement controls to secure it. While there are established data privacy frameworks such as the Payment Card Industry Data Security Standard (PCI DSS), the ISO 27000 family of standards, and the EU General Data Protection Regulation (GDPR), there are benefits to creating a custom framework for your organization. A custom Data Protection Framework will help you put an emphasis on the most sensitive and valuable data within your organization, and design controls that are suitable for your organizational structure, culture, regulatory requirements, and security budget. Follow the steps below to create a custom Data Privacy Framework. Conduct a Privacy Impact Assessment (PIA) to determine, for each type or classification or PII, how it is collected, where it is stored, and how it is disposed of, as well as the potential security risks for each type of PII. Change Management—tracking and auditing changes to configuration on IT systems which might have security implications, such as adding/removing user accounts. Data Loss Prevention—implementing systems that can track sensitive data transferred within the organization or outside it, and identify unnatural patterns that might suggest a breach. Data masking—ensuring that data is stored or transmitted with the minimal required details for the specific transaction, with other details masked or omitted. Ethical walls—implementing screening mechanisms to prevent certain departments or individuals within an organization from viewing PII that is not relevant to their work, or that might create a conflict of interest. Privileged user monitoring—monitoring all privileged access to files and databases, user creation and newly granted privileges, blocking and alerting when suspicious activity is detected. Sensitive data access auditing—in parallel to monitoring activities by privileged users, monitoring and auditing all access to sensitive data, blocking and alerting on suspicious or anomalous activity. Secure audit trail archiving—ensuring that any activity conducted on or in relation to PII is audited and retained for a period of 1-7 years, for legal or compliance purposes, and also to enable forensic investigation of security incidents. User rights management—identifying excessive, inappropriate, or unused user privileges and taking corrective action, such as removing user accounts that have not been used for several months. User tracking—implementing ways of tracking user activity, online and while using organizational systems, to identify negligent exposure of sensitive data, compromise of user accounts, or malicious insiders.